Our specially formulated MET-Rx Pre Workout is designed to help support you through tough training sessions. Our proven formulation will increase performance reduce fatigue and release energy. Creatine increases physical performance in successive bursts of short-term, high intensity exercise. Beneficial effect is obtained with 3g intake of creatine daily. Vitamin B6 contributes to the reduction of tiredness and fatigue. Vitamin B6 contributes to normal energy-yielding metabolism. 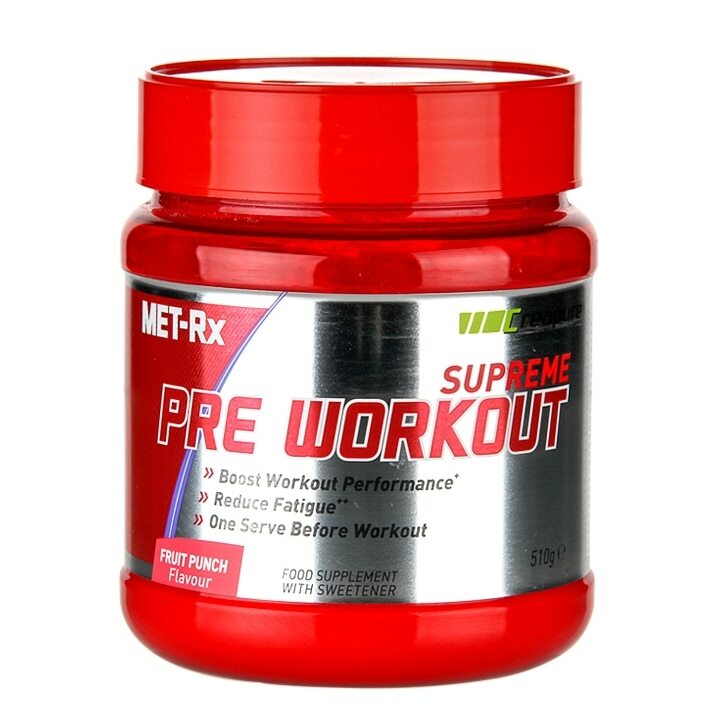 For adults, add one scoop (17g) of Supreme Pre Workout powder to 300ml of water and consume 30 minutes before or during a workout. Do not exceed stated dose. This product contains high levels of caffeine and other stimulating ingredients. To assess tolerance, users should use a half serving (1/2 scoop) for the first 7 days. Avoid use within 5 hours of bedtime prone to insomnia. Ensure adeuate hydration during and after training - Minimum of size to eight glasses of water daily. Citrulline Malate, BCAA Blend (2:1:1), Creapure Creatine Monohydrate, Beta Alanine, Fruit Punch Flabouring (Maltodextrin, Emulsifier (Arabic Gum), Sweetener (Sucralose), Natural Flavouring Substances, Colour (Carmoisine)), Betaine Anhydrous, Carnitine Tartrate, Sodium Bicarbonate, L-Taurine, Caffeine Anhydrous, Anti-Caking Agents (Silicon Dioxide, Calcium Silicate), Emulsifier (Sunflower Lecithin), Grapeseed Extract, Pine Bark Extract, Beetroot Extract, Trans Resveratrol, Vitamin B6 (as Pyridoxine Hydrochloride), Folic Acid, Vitamin B12 (as Methycobalamin). Food supplements must not be used as a substitute for a varied and balanced diet and a healthy lifestyle. If you are pregnant, breastfeeding, taking any medications or under medical supervision, please consult a doctor or healthcare professional before use. Discontinue use and consult a doctor if adverse reactions occur. Contains caffeine. Not recommended for children or pregnent women. Avoid additional consumption of caffeine, which may intensify adverse effects. Caution: Consult a doctor before use if you have or have had kidney disease. Not intended for use by persons under the age of 18. Keep out of reach of children. Do not use if seal under cap is broken or missing. MET-Rx Supreme Pre Workout Powder Fruit Punch is rated 4.0 out of 5 by 1.